August 21, 2016 0 comments on "Blackberry Pie Bars"
I have been spending the past week picking wild blackberries. Lots and lots of blackberries. There are lots of things you can make from blackberries. Pies and blackberry syrup are two of my favorite. 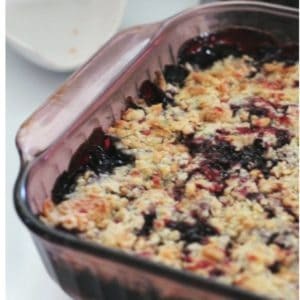 I recently stumbled across a recipe for these blackberry pie bars and I decided to give them a try. They’re wonderful, you have to try them! *If you don’t have fresh blackberries, you could substitute a can of blackberry pie filling. Just omit 1/2 c. sugar, cornstarch, and lemon juice. Stir together flour, 1 cup of sugar, baking powder, cinnamon, and salt. Use a pastry blender to cut in the butter, egg, and vanilla extract. If you don’t have a pastry blender, you can also use a food processor to mix it together. Mix until dough is crumbly. Pat half of the dough into the bottom of a greased 13x9x2-inch baking dish. Save the rest of the dough for the topping. In a medium bowl, stir together the remaining 1/2 cup sugar, cornstarch, and lemon juice. You can substitute 3 tbsp. bottled lemon juice for the fresh lemon. Gently stir in the blackberries. Gently spoon the blackberry mixture evenly over the crust. Sprinkle the remaining dough over the blackberries. Bake for about 45 minutes, or until top is slightly brown. Cool completely before cutting into squares. Bars will hold together best after completely cool. You can eat it while it’s still warm, but it will be more like an apple crisp in consistency. It’s good both ways!